While visiting the second highest capital city in the world, we quickly figured out why everyone was walking around a little slower than usual. In Quito, it was easy to feel out of shape any time you had to walk uphill or climb a set of stairs, and we did a lot of both during our short time here. Quito was just a quick stop for us, as this was our jumping point for the Galapagos, but we still managed to have some fun. Unfortunately, our first day in Quito was spent primarily in our room at Revolution Hostel. Why? Well, if you google malaria, you can quickly learn all of the disease’s symptoms, and Kristen had most of them. She didn’t sleep well the night before because she was constantly boiling hot or freezing cold (sweats and chills- check). Her back and neck were sore (muscle pains-check), her head was throbbing (headache- another check), and her stomach felt uneasy (nausea- and the final check). Oh dear. She slept on an off throughout the day, and Joe was very attentive. We had quite a few discussions that day about whether or not it was really malaria or just an unfortunate combination of symptoms. All these symptoms suddenly appeared the day after our long hike in the freezing cold rain. We figured that it could be malaria OR she could have a flu/cold from being out in the weather, her back and neck might have been sore from caring her purse awkwardly under her raincoat, and her stomach could be upset from something she ate. The one thing that prevented us from rushing to the hospital was that the symptoms were supposed to cycle on and off every few hours, and Kristen felt continually lousy. After the day of debate, we finally made a decision- if the symptoms cycled on and off, or if she felt significantly worse, we would head straight to the doctor (and we were conveniently located around the corner from several clinics and a hospital). Luckily, after she took a Nyquil and slept through the night, she felt significantly better the next day. We continued to monitor the symptoms, and since they never reoccurred, she either beat malaria in a day (wow, Nyquil works wonders), or she just had a quick flu. We’re betting it was the latter. That next day, with Kristen feeling better, we hit the city to see what we could find. 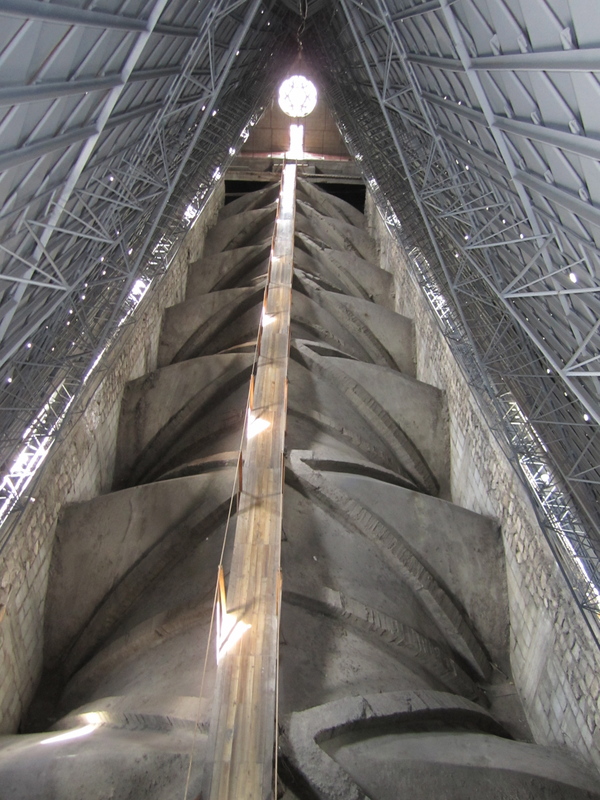 Our first stop was the Basilica del Voto Nacional, where we climbed the clock tower and spire. You know us, when there is an opportunity to climb something, we are in. 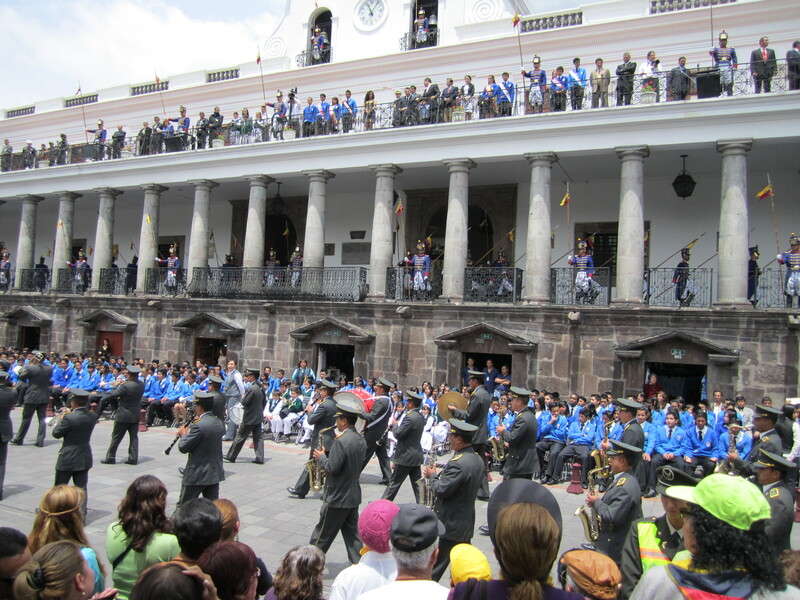 From the church, we made our way to the Plaza de la Independencia which is located in the heart of the old town. It turns out that luck was on our side because we arrived there at not only the right time, but also on the correct day of the week for the “Changing of the Guard.” We joined the crowd and watched it all unfold. We were more than surprised when the President and Vice President took time out of their busy days to join in the festivities and wave at the crowd. Joe felt extra lucky as he was able to get the President to wave back at him. Joe is still waiting for him to accept his friend request on Facebook. The ceremony was quite the show. All the guards were dressed to the nines and kept in perfect step with the band. They filed out of the two main door of the palace and took various positions around the palace and main square. Afterwards, we wondered around the old town and took in the great buildings and the culture. We made our way back to our hostel, and we found another hill to climb. Again, we fought for our breath as we climbed stairs, but in the end we were rewarded with a nice view. Seems like there has been a lot of uphill walking in Ecuador, which is weird because Joe thought it would be all downhill after crossing the equator. After the hike we headed back to our hostel to call it a night. Quito is a big city, and it was much nicer than we expected, but according to local sources, it is not the safest to wander around in at night. It was a good place to visit, and many interesting things happened, but not being “city” people we were ready to head out and on to our next adventure… The Galapagos! 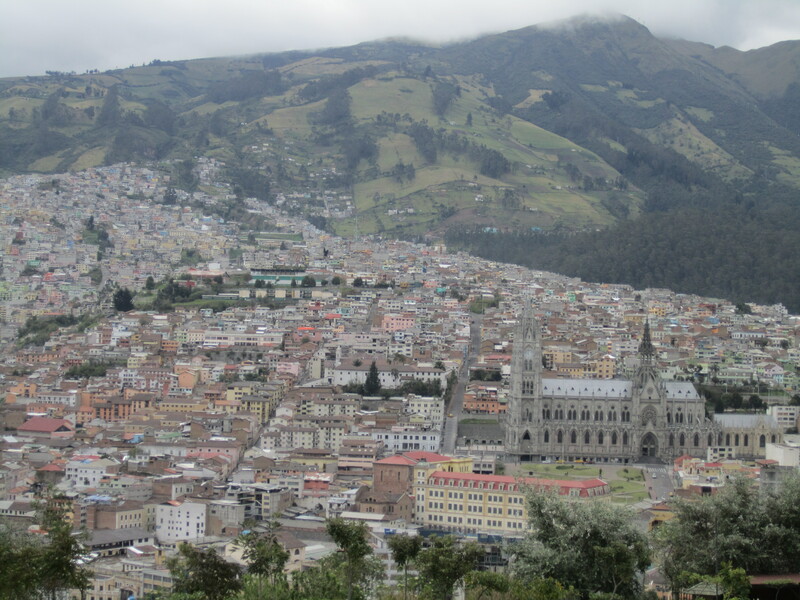 12 Responses to Quito: Is it malaria? Oh malaria. You have no power over Kristen. Just give it up. And I like the line about Joe being so attentive; I’m guessing that either Joe wrote this blog, or he snuck the line in without Kristen looking. As far as making me feel better about visiting, I’m not so sure I like this post. I’m getting a yellow fever vaccine, but jeez do I need anti-malaria meds too? I’ll pack my extra kidney too. Joe feels a little offended that you don’t see him as the next Florence Nightingale. He says if you get sick when you’re with us, you’re on your own. Your pocketknife better come with a scalpel for your extra kidney. Don’t worry… I’ll take care of you if you get malaria too. Hopefully it will be the one day kind that is cured with Nyquil! So excited to see you in about a month! We better start planning! The highs and the lows of traveling. YIKES! Glad you are both well again. A mother’s worry is never done! Maybe you should be hitting the kneelers at that church thanking God it wasn’t malaria. 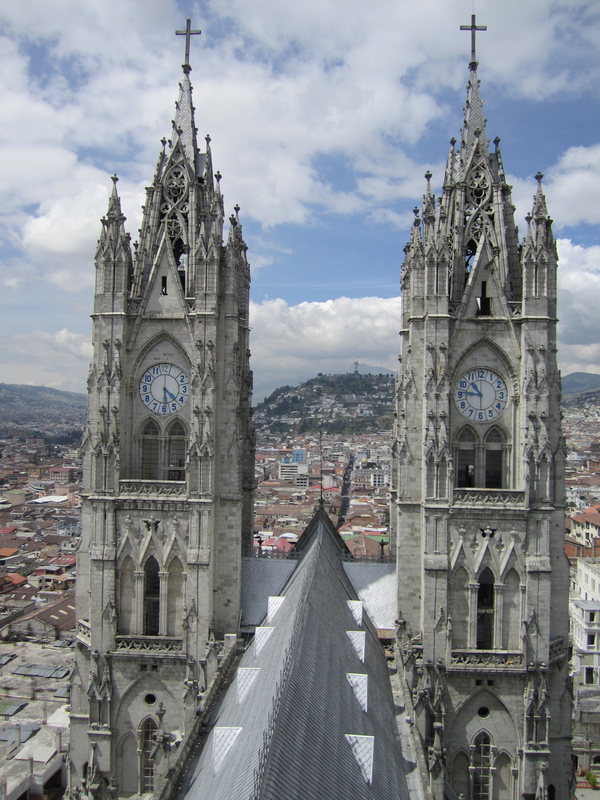 Quito does sound interesting, and your timing is amazing. 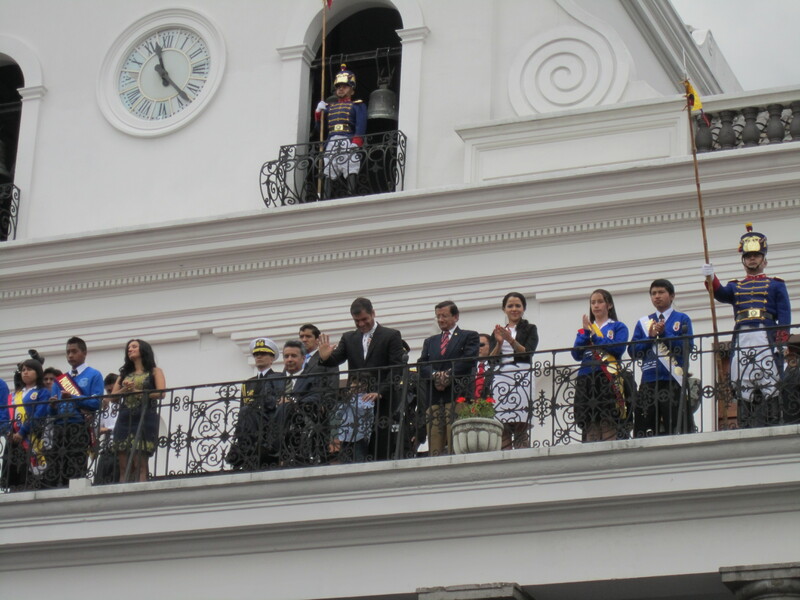 Not surprised President Correa waved to Joe. No matter where Joe goes..Japan, So. Africa or Camarillo, he just fits right in. No worries Mom! It was just a flu. We are having fun and being safe (as always). You guys are “betting” it’s not malaria? Lock yourselves into your room at night for safety? Ah, I love quotes that make me sleep better at night. Pass the Nyquil, please. I notice neither Kris nor Joe are in any of the pictures. Is it possible this post was written by kidnappers who are trying to hold off our realization that Kris and Joe have been taken? No Dad, it is us! Never fear. We are always careful. I am out of malaria danger. I need you to stay calm so Mom doesn’t worry! Man, I’m pretty sure your dad and my dad are exactly the same it makes me laugh. That kidnapper theory is something I’m sure they’ve been discussing together. I LOVE reading your guys blog, keep it up you locos. I’ve heard they use American money in Ecuador, and especially like our Dollar Sachecheweezen (sp?) dollars? Yes, they do use American dollars here… Makes the conversions a lot easier! They love the $1 coins, but they also accept paper ones too, but you don’t see them as often. Love reading all about your adventures! Glad you guys are having fun! We are loving our time here. Luckily the “malaria” lasted only a day and didn’t ruin our trip to the Galapagos! Hope all is going well in California!